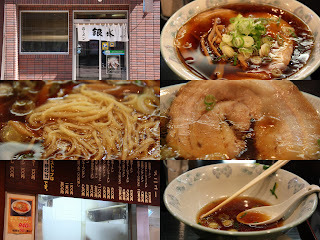 GO RAMEN!®: Day 6 - Welcome to Kushiro! Kushiro is a city on the eastern edge of Hokkaido. It's a quiet town with a very laid back feel. The people seem to act much like the sea otters that swim in the nearby Kushiro river. They mind their own business and only appear in short stints. Everyone is friendly and will generously help if you ask. 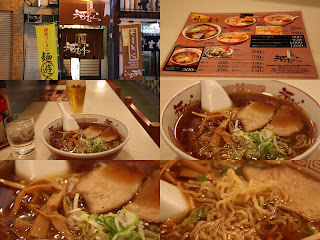 Their ramen is typically a light shoyu flavor made with chicken, katsuo, and onion. On this day, the cool, crisp air was perfect for it. Kushiro is also a great city to walk in. The various smells of fresh seafood and grilled fish fill the air. The first ramen-ya I visited was Ginsui. Here I ordered the Shoyu Chashu Men--a favorite among the locals. It's a basic Kushiro-style ramen that was delicious. The soup provided a slight tanginess that was eloquently masked by the shoyu. In addition to the traditional ingredients, Ginsui also uses konbu. You also get to choose from two choices of chashu: fatty or not. I of course went with the fatty chashu and it was delightful. This might sound odd, but the fat almost crunched in my mouth as I bit into it. The noodles were very thin and flat without much texture, yet they matched the soup perfectly. Adding black pepper also gave it another level. The second ramen-ya was recommended by the hotel receptionist. It was called Kushiro Ramen Kawamura. They also serve a traditional Kushiro-style ramen that is very light and pleasing to the palate. The chashu was a bit on the tough side, but housed some great flavoring. The noodles were virtually identical to Ginsui and once again matched the soup brilliantly. Kushiro is definitely a relaxing, stress-free city and it is reflected in their ramen. I had a nice time here, even though it was only for one day. I even managed to take close to 300 pictures while walking around. But don't worry, I've narrowed it down to 69 for you all to see. Enjoy! Where did you find the Neko Ramen! Well, it looks cold up there. Good thing this is GO RAMEN, and not GO ICE CREAM. @Brian: I got it at the Raumen Museum in Yokohama. I think ice cream is outlawed in these parts. @paul: Ha. I wouldn't want to live in Kushiro though. But maybe if I was eighty. Yo! I just got to Susukino. What's up with all the soap bars? Is that why you like it here? haha.